Take a trip through the history of filmmaking in this illustrated widescreen exploration of the people, technologies, and techniques that have shaped the course of cinema. Going back as far as prehistoric times, when cavemen played with light and shadow, to present day when we can stream Netflix into our living rooms, An Illustrated History of Filmmaking gets down to the nitty-gritty on everything film! 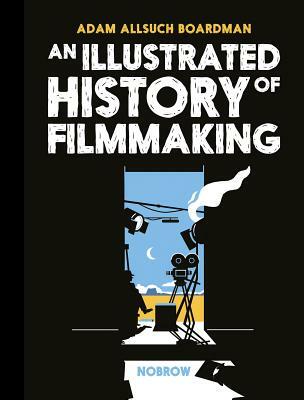 This illustrated guide shows filmmaking in action, chock full of factual information about actors and directors to the equipment and technology used throughout the ages. Featuring appearances from Hollywood heavyweights through time like George Lucas, Jean Luc Godard, Agnes Varda, Akira Kurosawa, and Stanley Kubrick, this book uses wonderfully detailed illustrations to illuminate film's past and to speculate on its exciting future! Adam Allsuch Boardman is an illustrator based in Leeds, who recently completed his BA Illustration degree at Leeds College of Art. He has worked on a variety of projects including merchandise for the Hyde Park Picture House, and producing imagery for several museum projects. Fuelled by an interest in the trivial, and a fastidious study of detail, Adam enjoys illustrating a variety of subjects. "A must for anyone with a deep appreciation for cinema. [...] It’s hard to do justice to this eye-popping book in just a few sentences — this is one you need to see for yourself."